Shewanella genus is famous for applications like electron transfer in microbe fuel cells and bioremediation of heavy metals through the Mtr pathway. A potential way to enhance the electron genesis ability of Shewanella is to express exogenous mtr genes via recombinant DNA technology. Thus, to design and develop expression vectors capable of replicating in Shewanella and enhance the genetic toolbox of the same is important. 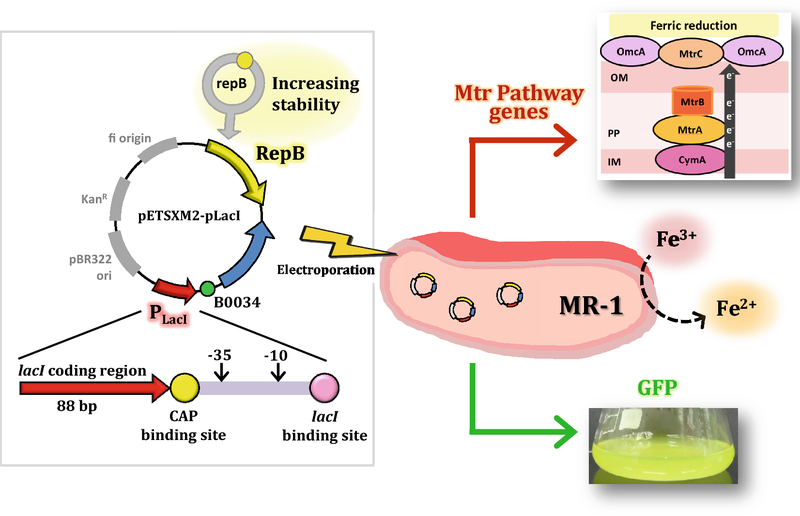 In this study, a plasmid construct with a replication origin, repB, and pLacI promoter is reported for the first time to drive the expression of green fluorescent protein in S. oneidensis MR-1. Based on the same vector, the Mtr pathway genes mtrA, mtrC, and mtrCAB were also successfully expressed in MR-1. The recombinant strains had higher ferric reductase activity compared to the wild type. The highest enzymatic activity of 508.33 U/L in genetic Shewanella with mtrC gene is obtained, which is 1.53-fold higher than that of wild strain. The plasmids were stable up to 90 generations. We have demonstrated an expression system based on pLacI promoter and repB ori in Shewanella. Consequently, the combination of repB and pLacI will have great potential in Shewanella to turn on expression of different genes constitutively. In recent years, energy conservation, environmental protection, and circular economics are of great importance in a highly resource-limiting world. As a matter of fact, bioremediation, bioeconomic, and generating energy by waste to electricity are becoming increasingly important (Chen et al. 2013; Chaturvedi and Verma 2016; Ng et al. 2017; Takahashi et al. 2016). Among most of microorganisms used in bioenergies and bioresources, Shewanella genus is the most important dissimilatory metal reducing bacteria (DMRB) which have been widely studied for biodecolorization, bioremediation, microbe fuel cell, and biofabrication (Bretschger et al. 2007; Jayasinghe et al. 2014; Nealson and Scott 2006; Ng et al. 2014a, b; Wu and Ng 2017). Among all properties, the great interests of Shewanella come from their ability to conduct anaerobic respiration using diverse electron acceptors such as Fe(III), oxygen, nitrate, and other metals. 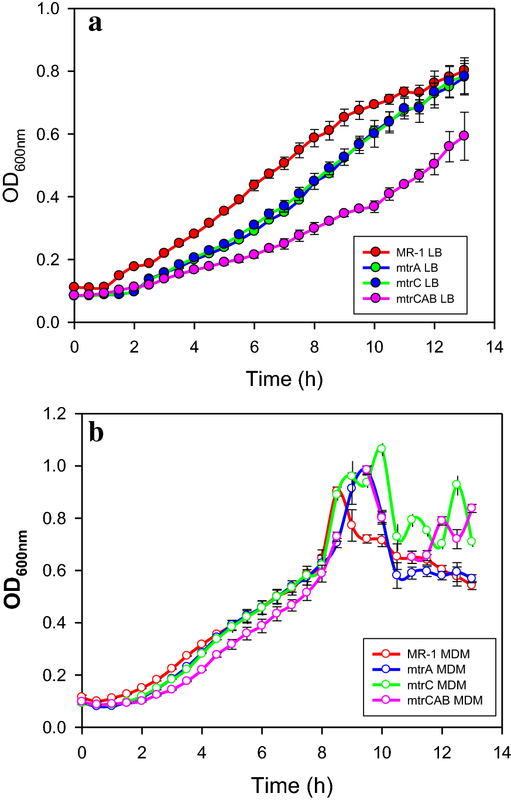 S. oneidensis MR-1 is a facultative anaerobe, which can reduce several metal ions such as Mn(IV) and Fe(III) through the Mtr pathway (Bretschger et al. 2007). The mechanism of electron transfer in Mtr pathway is as follows: the electrons are transferred from the inner-membrane, through the periplasm and across the outer-membrane to the extracellular surface. The protein components for the Mtr pathway include CymA, MtrA, MtrB, MtrC, and OmcA, which are in the sequence omcA–mtrC–mtrA–mtrB–cymA in Shewanella genome. The electron-transfer reaction mediated by Mtr pathway has also been applied for biotechnological applications in electro-biosynthesis of valuable materials, chemicals or fuels (Shi et al. 2012). Recently, a synthetic electron conduit has been engineered in E. coli by heterologous expression of the Mtr gene from S. oneidensis MR-1 (Jensen et al. 2010). Therefore, to accelerate the function of the electron conduit in Shewanella and how to turn it on efficiently is of utmost importance. However, studies on molecular and genome of Shewanella are restricted due to lack of effective vectors, expect the pDS3.0 (Yuan et al. 2011). The pDS3.0 is a knock out vector and carries out gene knockout when transformed via conjugation by E. coli WM3064. However, the system is incapable of gene expression in Shewanella (Yin et al. 2013). For further genetic studies in Shewanella, it is important to have reliable plasmid based expression vectors. The term “plasmid” was proposed for the first time in 1952, regarding to any heritable elements independent of chromosomal DNA (Lederberg 1952). Plasmids consist of several basic elements including origin of replication (ori), promoter, insertion gene, antibiotic resistance, multiple cloning sites, and some additional genes. In particular, the ori region is essential for replication and maintenance of the plasmid in the cells, and promoter is required for gene expression. Thus, an appropriate ori is required for Shewanella to maintain the plasmid efficiently. On the other hand, promoter element, which is essential for transcription of a gene, plays a critical role in controlling the expression level of downstream genes (Jana and Deb 2005). There are very few reports referring to recombinant expression in Shewanella currently. The heterologous expression of the udp genes from S. oneidensis MR-1 has been reported (Mordkovich et al. 2012, 2013). Besides, the promoter, tac, coupled with a synthetic flavin biosynthesis pathway from Bacillus subtilis has been shown to enhance extracellular electron-transfer (EET) rate of S. oneidensis MR-1 (Yang et al. 2015). Recently, we observed that promoter pLacI (R0010) combined with RBS (B0034), which was designed by iGEM, was activated efficiently in S. oneidensis MR-1. The RBS (B0034) was shown to have an efficiency of 1.0 and more detailed information is available on the website (http://parts.igem.org/Part:BBa_B0034). The gene sequence encoding pLacI was amplified from lacZYA operon of E. coli MG1655 genome. So far, pLacI has been widely used for general recombinant expression in E. coli (http://parts.igem.org/Part:BBa_R0010). As E. coli and Shewanella are Gram negative bacteria, it is possible that pLacI has a great potential to be a common promoter for the expression of exogenous gene in Shewanella. 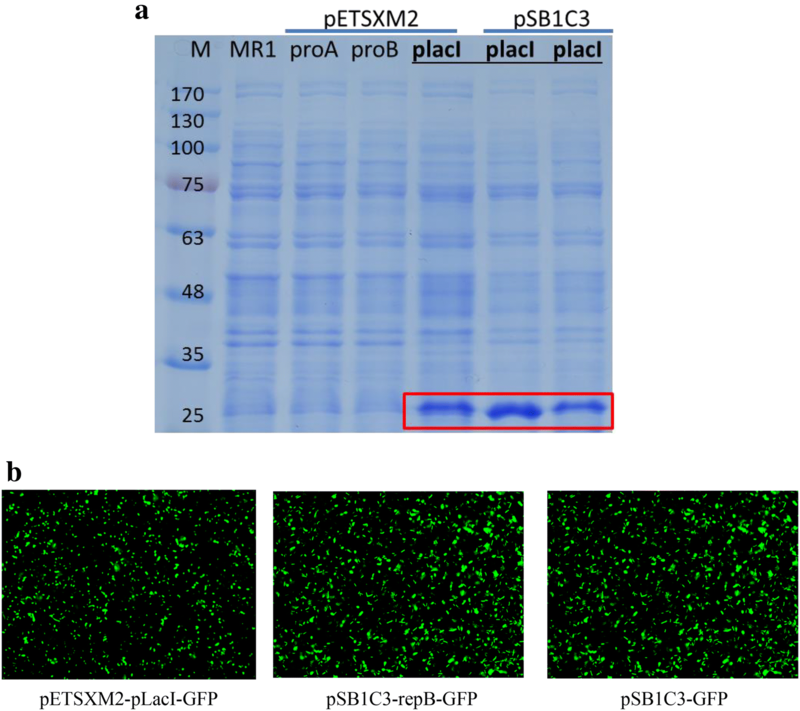 In the previous study, repB from pSXM33 has been explored in S. xiamenensis BC01 and considering its propagation in S. oneidensis MR-1 (Zhou and Ng 2016). It has been ensured that pSXM33 is retained for cell division in Shewanella. In this study, the transformation efficiency of plasmids harboring various replication origins for Shewanella was evaluated. First, we developed a functional ori for stable replication of plasmids in Shewanella. Several promoters were also tested for gfp gene expression in Shewanella. Finally, we provided a proof-of-concept by combining repB and placI for expression of GFP gene in Shewanella, and followed by demonstrated expression of Mtr pathway as a proof-of-function in enhancement of ferric (Fe) reductase activity in MR-1. Bacterial strains, plasmids, and primers used in this study are given in Additional file 1: Table S1. Reagents used for plasmids construction including Ex-Taq polymerase, PCR-grade dNTPs, restriction enzyme, T4 ligase, and DNA ladder marker were purchased from Takara (Japan), while Phusion polymerase used for POE-PCR was obtained from NEB (USA). All DNA manipulations were performed according to standard protocols. PCR products and restriction-digested DNA were purified with PCR clean-up and gel extraction kits (GeneDirex, USA). The plasmids were isolated using Plasmid Extraction Mini Kit (Favorgen, Taiwan). Genomic DNA was isolated from 5 mL cells (overnight culture at 37 °C in LB broth) using a bacterial genomic DNA miniprep Kit (Axygen, USA). A recombinant plasmid denoted as pSB1C3-repB-GFP was constructed (Additional file 1: Fig. S1A). The gene sequence of repB was amplified from plasmid pSXM33. After PCR, the DNA fragment was digested with PstI/SpeI, followed by ligating into pSB1C3-GFP. Three recombinant expression vectors for GFP expression with the same backbone and different promoters, including pETSXM2-proA-GFP, pETSXM2-proB-GFP, and pETSXM2-pLacI-GFP were also constructed (Additional file 1: Fig. S1B). The promoters (proA and proB) were amplified from plasmid pSXM33 and subsequently assembled with gfp via fusion PCR. The gene fragments encoding GFP and pLacI-GFP were amplified from plasmid pSB1C3-GFP. Afterwards, the DNA fragments of proA-GFP, proB-GFP, and pLacI-GFP were digested with XhoI/PstI and inserted into plasmid Multi-pETSXM2. The plasmids for recombinant expression of Mtr pathway genes, including pETSXM2-pLacI-MtrA, pETSXM2-pLacI-MtrC, and pETSXM2-pLacI-MtrCAB containing genes mtrA, mtrC, and mtrCAB respectively, were constructed using Prolonged Overlap Extension PCR (POE-PCR) (You and Zhang 2014) and the results are shown in Additional file 1: Fig. S1C. The genes that encoded MtrCAB are clustered in the sequential order mtrC, mtrA, and mtrB in S. xiamenensis BC01 (BCRC 80958) genome. All the POE-PCR products were transformed into E. coli strains DH5α and BL21(DE3), respectively. Recombinant colonies grown on LB plates with 50 μg/mL of kanamycin were confirmed by colony PCR. Then the correct plasmid constructs were isolated and transformed into S. oneidensis MR-1 via electroporation. Plasmids were transformed into S. oneidensis MR-1 via electroporation as described previously with some modifications (Nováková et al. 2013; Rachkevych et al. 2014). Aerobically grown, mid-log phase cells at OD600nm of 0.5–0.8 were chilled on ice about 20–30 min and harvested by centrifugation at 4000×g, 4 °C for 10 min. The pellets were washed twice with half of the volume ice-cold sterile water and centrifuged at the above conditions, then suspended in distilled water to the final OD600nm at 125–200. The obtained competent cells were poured into aliquots of 50 μL in sterile micro-tubes. The competent cells were mixed with 0.4 μg of plasmid DNA, transferred into precooled electroporation cuvette (0.2 cm) and electroporated for 5 ms at 2.5 kV using MicroPulser™ electroporation apparatus (Bio-Rad, USA). After electroporation, 0.95 mL SOC medium (2% (w/v) tryptone, 0.5% (w/v) yeast extract, 0.05% (w/v) NaCl, 2.5 mM KCl, 10 mM MgCl2, 20 mM glucose) was added to the cuvette immediately. The cells were quickly and gently suspended, transferred to culture tubes and incubated at 30 °C for 2 h or longer. Appropriate concentration was spread on LB agar plate containing the 25 μg/mL of chloramphenicol, 50 μg/mL of kanamycin or 100 μg/mL of ampicillin, respectively. The plates were incubated at 30 °C for 24–36 h. Screening of colonies for identification of positive cases were confirmed by restriction digestion of the isolated plasmids. Shewanella oneidensis MR-1 was aerobically cultivated in LB broth (0.5% (w/v) yeast extract, 1% (w/v) tryptone, 1% (w/v) NaCl), or in a modified defined medium (MDM; 30 mM Pipes, 60 mM sodium dl-lactate, 28 mM NH4Cl, 1.34 mM KCl, 4.35 mM NaH2PO4, 7.5 mM NaOH, 30 mM NaCl, 1 mM MgCl2, and 0.05 mM ferric nitrilotriacetic acid) (Pirbadian et al. 2014) at pH 6.5 and 30 °C with constant shaking at 150 rpm. E. coli DH5α and BL21(DE3), the cloning hosts were incubated in LB broth at pH 7 and 37 °C with constant shaking at 200 rpm. A single colony was picked from LB agar plate and grown overnight with 3–5 mL LB, then 1% (v/v) broth was transferred into fresh LB broth. S. oneidensis MR-1 and E. coli transformants were selected on LB plates supplemented with the following relevant antibiotics: 25 μg/mL of chloramphenicol, 50 μg/mL of kanamycin, and 100 μg/mL of ampicillin, respectively. The culture of S. oneidensis MR-1 harboring different recombinant plasmids was diluted into OD600nm of 1.5 by centrifugation and resuspension. The cells were observed using Inverted Microscope (Nikon Eclipse, Japan) with Plan Fluor 40× Ph2 DLL Phase Contrast Eclipse Microscope Objective (Nikon, Japan) and imaged using Charge-coupled Device CoolSNAP HQ2 (Photometrics, USA). All the operations were conducted according to the instructions and captured at the excitation wavelength 465–495 nm. Fe reductase assay was carried out under micro-anaerobic condition, which meant all the reagents were degassed for 10 min before use. The ferrozine combined with Fe(II) and formed purple complex and the absorbance of the complex was measured at 562 nm with modification (Stookey 1970). The activity of Fe reductase was calculated based on the rate of increasing absorbance at 562 nm (ε562nm = 2.9 × 104 M/cm). The 200-μL reaction mixture contained 90 μL of 50 mM sodium phosphate buffer (pH 7.0), 40 μL of 2 mM Fe-citrate, 10 μL of 2 mM ferrozine and 40 μL of 10 mM sodium formate and 20 μL of cell culture at OD 3. The mixture sample was measured every 3 min for total 2 h via SpectraMax 340PC-384 (Molecular Devices, USA). All experiments were performed in triplicate independently. The cells harboring different recombinant plasmids were grown overnight and harvested by centrifugation at 8000×g for 10 min. The cell pellets were washed with deionized water twice and re-suspended in deionized water to OD600nm of 4. One volume cell was immersed in 20% (w/v) sucrose in 0.1 M Tris–EDTA for 20 min at 4 °C to exclude the periplasma (P). The pellets were collected by centrifugation at 12,000 rpm for 10 min and re-suspended in deionized water and followed by high-press disruption (One Shot, Constant systems, UK) to obtain the supernatant (S). Protein dye (SD6032, Sangon, China) without DTT was used in running the native-PAGE with 10% poly-acrylamide. The heme staining protocol was modified as reported previously (Thomas et al. 1976). In brief, all the process was performed in the dark. First, the gel was soaked in 0.25 M sodium acetate (pH 5) for 20 min and then 15 g/L of 3,3′,5,5′-tetramethylbenzidine (TMBZ, Sigma) dissolved in methanol was added. The gel was allowed to soak in the solution in an orbital shaker at 70 rpm for 15 min. The proteins were visualized by adding 200 µL of 30% (v/v) hydrogen peroxide within 30 min. The MALDI-TOF-TOF analyses were performed in positive ionization mode using an AB SCIEX TOF/TOF 5800 System (Applied Biosystems, USA). The method was performed regarding to previous study with some modification (Ng et al. 2014a, b). The protein was first digested by 1% (w/v) trypsin overnight and the digested protein was recovered by lyophilization. Peptide was loaded into the instrument by accelerating voltages of 20 and 8 kV which was used for MS/MS measurements. Raw spectral data were further processed using Data Explorer 4.6 software (Applied Biosystems, USA) and followed by MASCOT analysis. The plasmid stability analysis was performed as described previously with some modifications (Ashiuchi et al. 1999). Cells harboring different plasmids were grown and sub-cultured in LB medium until the total number of generations had reached 90. When the number of generation had reached 30, 60, and 90, the cell culture was spread on LB plates both with and without appropriate resistance. After 12 h incubation at 30 °C, colonies (CFU) were counted and the ratio of antibiotic resistant colonies to the total number of colonies was used to estimate the percentage of cells maintaining the plasmid. All experiments were performed in triplicate independently. Plasmids used in Shewanella are summarized in Table 1. Saffarini and Nealson reported that plasmid pACYC18 containing the p15A ori can’t replicate in S. oneidensis MR-1 (Saffarini and Nealson 1993). However, the above conclusion was contradicted by Myers, who proved that pACYC18 could independently replicate in MR-1 (Myers and Myers 1997). In addition, it is worth mentioning that pUC vector or pUC-derived vector functioned well in S. oneidensis (Nováková et al. 2013; Ozawa et al. 2001). Recently, some of ColE1-type plasmids (i.e., pBR328; pECFP-c1; pZA31; pZE21), pSC101 ori plasmids (i.e., pHM1884; pZS24luc) and P1 phage-derived plasmid (i.e., pSP102) could be transformed into S. baltica (Milewska et al. 2015). Therefore, ColE1-type plasmids mainly with the well-known origins of ColE1, pMB1, and p15A could be adapted for plasmids to be used in Shewanella. However, another plasmid pWUZ1 harboring ColE1 origin could not replicate in S. baltica under tetracycline selective pressure (Studier et al. 1990). Coincidentally, pACYC18 transformants could not be isolated under tetracycline selective pressure (Myers and Myers 1997), but few ampicillin-resistant (ApR) transformants were obtained (Ozawa et al. 2001). The data indicated that it was very difficult to express tetracycline resistance gene for achieving tetracycline resistance in Shewanella genus. As a conclusion, selection of an appropriate antibiotic resistance gene as a selection marker that can be expressed in Shewanella can aid in easier selection of transformants and achieve higher efficiency of transformation. To deeply explore various replication ori which is suitable for S. oneidensis MR-1, we use several vectors with different types of ori. The information of origin, size, antibiotic resistance, and efficiency of transformation are shown in Table 1 and Fig. 1. The result of pBAD33 with p15A ori is consistent with previous study (Ozawa et al. 2001). The plasmid pSFKW33 from Shewanella sp. 33B (Werbowy et al. 2009), and plasmid pSXM33 from S. xiamenensis BC01 (Zhou and Ng 2016) with ori of R-6K like and repB are function in different kinds of Shewanella. Moreover, we further confirmed that pCRISPR-Cas9 with p15A (ori) and pBluescript-SK(II) with pUC (ori) can be introduced into MR-1 (Fig. 1). As aforementioned, we have constructed two shuttle vectors for E. coli and Shewanella (i.e., pETSXM1 and pETSXM2) on the basis of the ori repB from pSXM33, and ori pMB1 from pET28a(+) (Zhou and Ng 2016). We observed that the plasmids pETSXM1 and pETSXM2 could be transformed into MR-1, but pET28a(+) could not. It showed that repB played a decisive role and directed replication independently. 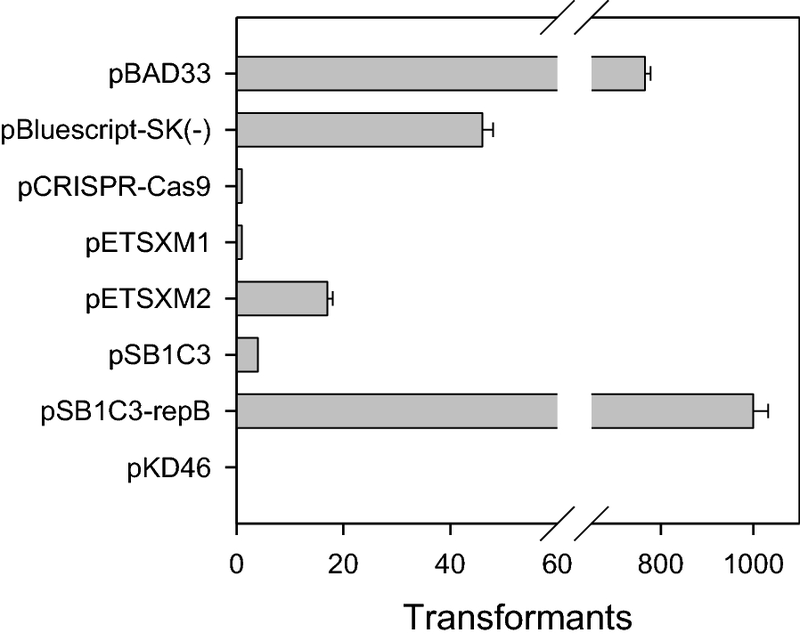 As pETSXM2 (3364 bp) showed a 16-fold higher efficiency of transformation than pETSXM1 (6898 bp), it is indicated that the size of plasmid for transformation was critical. Notably, the vector pSB1C3-repB with repB ori has much higher transformation efficiency (i.e., 1000 colony foaming units) than the parental plasmid pSB1C3 (only 6–8 colony foaming unit), suggesting that repB positively influenced the replication and maintenance of plasmids in Shewanella. The promoter proA and proB from the plasmid pSXM33 were identified as hypothetical promoters (Zhou and Ng 2016), while the promoter pLacI have been widely used in E. coli. Herein, we found that only promoter pLacI could drive the expression of GFP in S. oneidensis MR-1 among the above mentioned promoters. As shown in Table 2, all the cells carrying different recombinant plasmids with the same promoter (i.e., pLacI) expressed GFP successfully under pLacI. Besides, the order of CFU is ranking from pSB1C3-repB > pETSXM2-placI, pETSXM2-proA, pETSXM2-proB, and pSB1C3 (in numbers: 1000, 888, 358, 288, and 4). The cells carrying recombinant plasmids with the promoter proA and proB preserved the red color that was the original color of MR-1. The results were consistent with SDS-PAGE analysis (Fig. 2). The cells harboring recombinant plasmids with pLacI as promoter, including pETSXM2-placI-GFP, pSB1C3-GFP, and pSB1C3-repB-GFP, had a clear band at 26 kDa representing GFP. In addition, the fluorescence of GFP could be observed via fluorescent inverted microscope from the cells harboring pETSXM2-placI-GFP, pSB1C3-GFP, and pSB1C3-repB-GFP, respectively (Fig. 2b). Thus, promoter pLacI enabled successful gene expression both in E. coli and S. oneidensis MR-1. As the proA and proB are hypothetical promoters as predicted by the gene prediction software Softberry (http://www.softberry.com/), it is implied that the non-functional nature of those hypothetical promoters prediction should present more constraints in gene expression. The possibility of a functional upstream or downstream transcription region with these two promoters is uncertain. Thus, the authenticity and applicability of proA and proB for Shewanella requires further investigation. The pLacI promoter sequence with original length of 200 bp, consists of 88 bp of the end of lacI repressor region, CAP binding site, lacI binding site and the natural promoter for lacZYA gene. As pLacI is constitutive when the lac repressor (lacI or lacIq) and CAP protein are absent, it should be a powerful promoter which can activate both in Shewanella and E. coli, and the transcription machinery of pLacI is relatively simple. To the best of our knowledge, this is the first report for expression of GFP in Shewanella by pLacI. Several plasmids, (i.e., mtrA, mtrC, and mtrCAB into plasmid pETSXM2), which overexpressed the Mtr genes under the promoter pLacI and repB was constructed in S. oneidensis MR-1. The plasmids were confirmed by agarose electrophoresis and DNA sequencing. The size of mtrA, mtrC, and mtrCAB were 4902, 5886, and 9062 bp, respectively (Fig. 3a). The expression-level analysis of these genes by heme staining in Native-PAGE was performed (Fig. 3b). From the plasmids harboring mtr genes, a significant band with a molecular weight near 70 KDa was observed. It was predicted as the cytochrome c (MtrC) by MASCOT protein identification (Table 3). 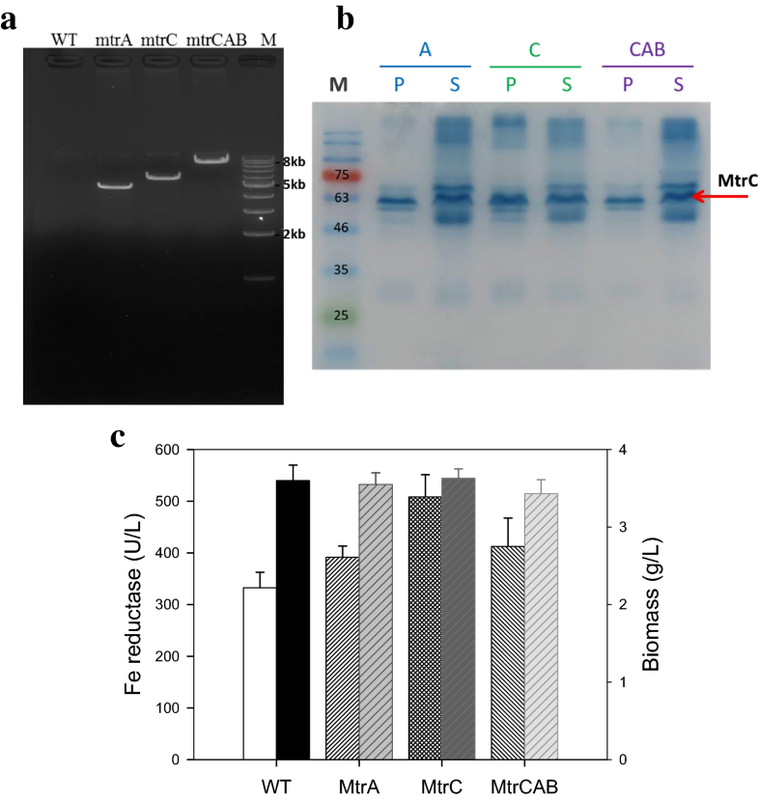 Furthermore, MR-1 with the plasmids pETSXM2-placI harboring mtrA, mtrC, and mtrCAB had higher ferric reductase than that of the wild strain. Among all, the mtrC strain had highest ferric reductase activity of 508.33 U/L, which was 153% as of wild strain (Fig. 3c). The activity was followed by strains with gene of mtrCAB, mtrA, and wild type, in terms of 412.5, 391.4, and 345.1 U/L, respectively. Moreover, biomass for different strains was similar, at 3.5 g/L. As we knew, MtrA, located in the periplasm of MR-1 was considered as an important gene for Fe(III) and Mn(IV) reduction (Beliaev et al. 2001). The MtrB located in the outer-membrane of MR-1 aided MtrC in metal binding for reduction (Beliaev and Saffarini 1998). And MtrC, found in the outer-membrane played an important role in Fe(III) reduction. Mtr pathway allowed electron transport from the cell interior to the extracellular inorganic material. Based on the result of Fig. 3b, c, it indicated that enhancing Mtr pathway via recombinant expression of mtr gene under the promoter pLacI was successful. The four recombinant strains had different growth rates in LB and MDM medium (Fig. 4). The wild strain had the highest growth rate, and the mtrCAB strain had the lowest growth rate, while the mtrA and mtrC strain had analogous growth trends. As larger plasmid size would burden cell growth, the strain with mtrCAB had lower growth rate. In the previous study (Pirbadian et al. 2014), it was observed that minimal or defined medium was beneficial to Shewanella in oxido-reduction with sodium dl-lactate as the major elector donor. In the absence of oxygen, Shewanella grew by coupling the oxidation of simple organic acids, alcohols, or aromatic compounds to the reduction of Fe(III) or Mn(IV). In this study, we first analyzed cell growth in a modified defined medium (MDM) and LB medium. As shown in Fig. 4, the cell growth among all strains was higher in LB medium than that in MDM. We also observed that there was no significant difference in ferric reductase activity when the strains were grown in MDM or LB (data not shown). In MDM medium, the cell growth of all strains became slower during the late phase (i.e., 600 min) because of insufficient nutrition. In summary, LB medium is required in long term fermentation while MDM is preferred in short term culture as it is much cost effective. Plasmid stability analysis was performed by analyzing colonies forming units (CFU) in the presence and absence of antibiotics for all different strains as shown in Fig. 5. The three strains with plasmid pETSXM2-placI mtrA, mtrC, and mtrCAB exhibited high stability when the cell generation number reached 90 in the medium with (black bars) or without appropriate resistance (white stack-bars). But the colonies with plasmids harboring GFP showed a lower number, which trended down to 4.5 × 106 after 90 generations. 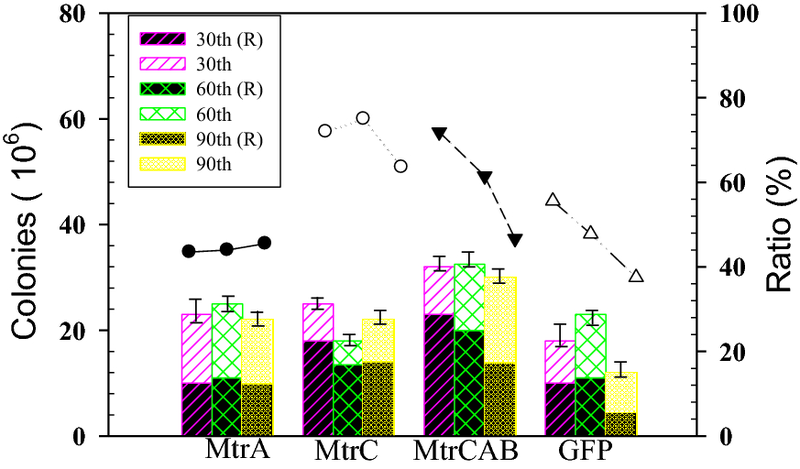 The ratio of colonies between medium with and without resistance was around 75% for MtrC, 62% for MtrCAB, 1% for MtrA, and GFP in 90 generations (Fig. 5). The results indicated that the plasmid exist stably in the host cells. The ori region is required for plasmid self-replication while the size of the plasmid and the type of selective marker can influence the transformation efficiency, and plasmid stability is critical in genetic engineering. ColE1 is very stable under most growth conditions in Gram negative bacteria (Summers and Sherratt 1984). The plasmids with ori regions of ColE1, pMB1, and repB are shown to be relatively stable in Shewanella, comparable to other Gram negative bacteria (Kües and Stahl 1989). Herein, we found that repB from pSXM33 which originally existed in S. xiamenensis was stable and function in MR-1. Genetic engineering in Shewanella is limited mainly due the lack of stable plasmids and reliable expression systems. We proved that ori repB from pSXM33 and pLacI promoter from E. coli is functional in S. oneidensis MR-1. 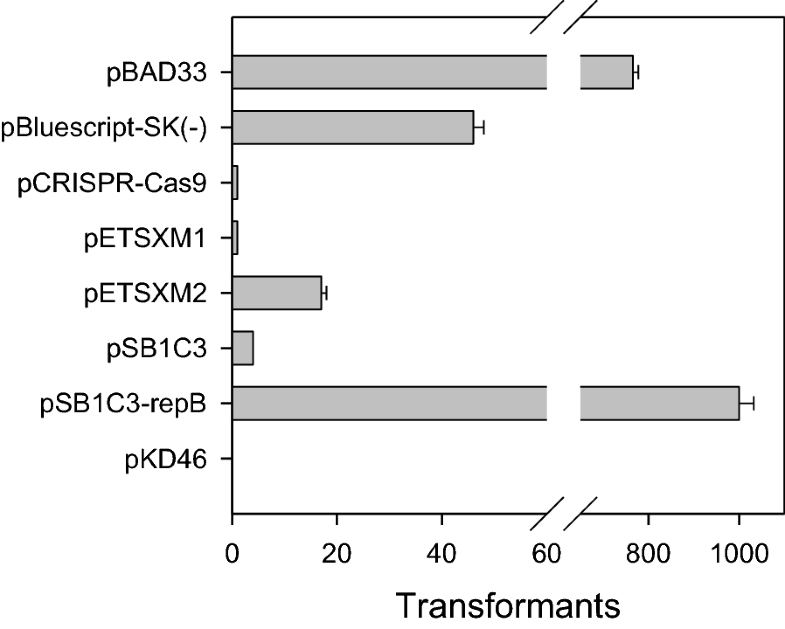 Plasmid constructs with ori repB had higher efficiency of transformation compared to others. The pLacI promoter was functional in S. oneidensis MR-1, driving the expression of GFP, which is reported for the first time. Based on the ori repB and pLacI promoter, genes for the metal reducing pathway (MTR) were expressed in S. oneidensis MR-1 and the ferric reductase activity was improved in the recombinant strain. ISN and YZ designed the experiment and analyzed the data, YZ and YG performed most of experiments in genetic section. JWW, YCY and SIT did the enzymatic experiments. ISN and YG wrote the manuscript. All authors read and approved the final manuscript. The authors are grateful for the financial support received for this project from the Ministry of Science and Technology (MOST 105-2221-E-006-225-MY3 and MOST 105-2621-M-006-012-MY3) in Taiwan. We also sincerely appreciate the academic connection between Xiamen University (China) and National Cheng Kung University (Taiwan). The authors approved the availability of data and materials for publishing the manuscript. The authors approved the consent for publishing the manuscript. All the authors have read and agreed the ethics for publishing the manuscript. 40643_2018_221_MOESM1_ESM.docx Additional file 1: Table S1. Bacterial strains, plasmids and primers used in this study. Fig. S1. Recombinant plasmids in this study. (A) The plasmid pSXM33 from S. xiamenensis BC01, and pSB1C3-GFP from iGEM were used to construct pSB1C3-repB-GFP for over-expression of GFP. (B) Different ori and promoters (proA, proB and placI). (C) Over-expression vectors harboring MtrA, MtrC and MtrCAB with repB and placI.